I picked this up on a whim more than a year ago and finally played it this weekend. Online reviews were right! My friends and I were not impressed. A collaborative game could be a lot of fun, trying to weather harsh conditions and ration resources until the bitter end, but this sadly was not it. 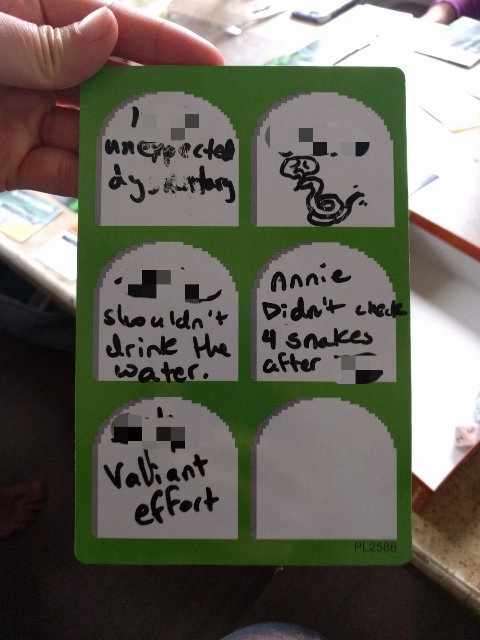 Gameplay consisted of taking turns laying down trail cards and doing whatever the card said (grab a calamity card, roll dice to see if you crossed a river successfully, or nothing at all.) Calamity cards had diseases that could be fixed by resources or… Dysentery! Snake bite! (Instant deaths). Make 10 stacks of 5 cards with at least one living member of the wagon and you will have made it to Williamette, Oregon! 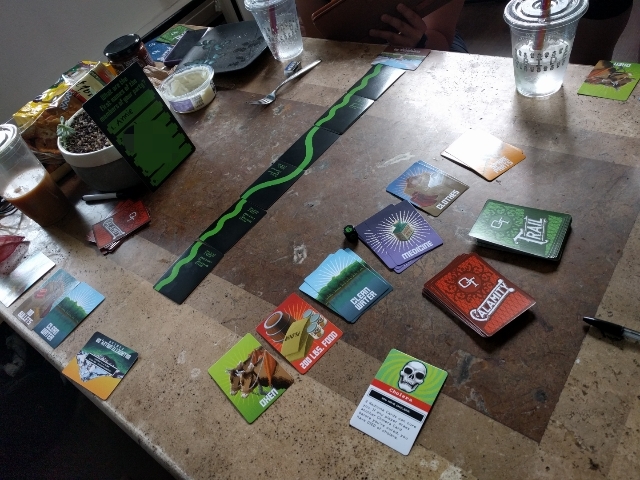 So, overall, simple and not engaging, but it had a smidge of the Oregon Trail charm. See our tombstones (written with erasable marker, which was a fun touch)! I saw this in Target once and sent a pic to @tim, as we both had, hmmm, memories of the computer game! They are probably fond. I will share what I’ve learned some day, because the events around, leading up to, during, and afterward are so weird, in only the way frontier California can provide. A side affect is I’ve been studying the history of beating a path across America, and it seem ripe for gaming material! Now I want to play it, and see how we could improve it! I love the idea of deck building and collab, so we should hack together such a game. Ooh, Donner Party, I remember being captivated by that as a kid (who wasn’t, I guess)? Would definitely be interested in hearing what you learned. Moar resource management and teamwork! Oh, and mission building! How could I forget that. As in… “missionary religious establishments”, or “serious-sounding quests”? I’ve been secretly studying/obsessing over the Donner Party. Gnarliest thing is the monument… the stones mark how high the snow was there during that winter. in fourth grade, every child in public school in california builds an adobe mission out of kits from michael’s, with the same little dusty trees. i remember the curves and arches and adobe coloring so starkly. fancier kits include bells you attach with a toothpick. some have three bells in three little arches. i remember the curves and arches and adobe coloring so starkly. I will share what I’ve learned some day, because the events around, leading up to, during, and afterward are so weird , in only the way frontier California can provide. My immediate family has totally been a little fascinated with the Donner Party for years. Like we make an above average amount of Donner Party jokes I think. But we are wierd people. That being said. Someone should do a Donner Party riff on the Oregon Trail game. That would get my attention more so than Organ Trail. (Side note, ive pondered off an on for years a Battle-Star esque riff on Oregon Trail, where your trying to get a fleet of survivors back to their homeworld too). That would get my attention more so than Organ Trail. that reminds me! i actually played the iOS game “organ trail,” which was a faithful fan remake except you’re killing zombies. it was great.